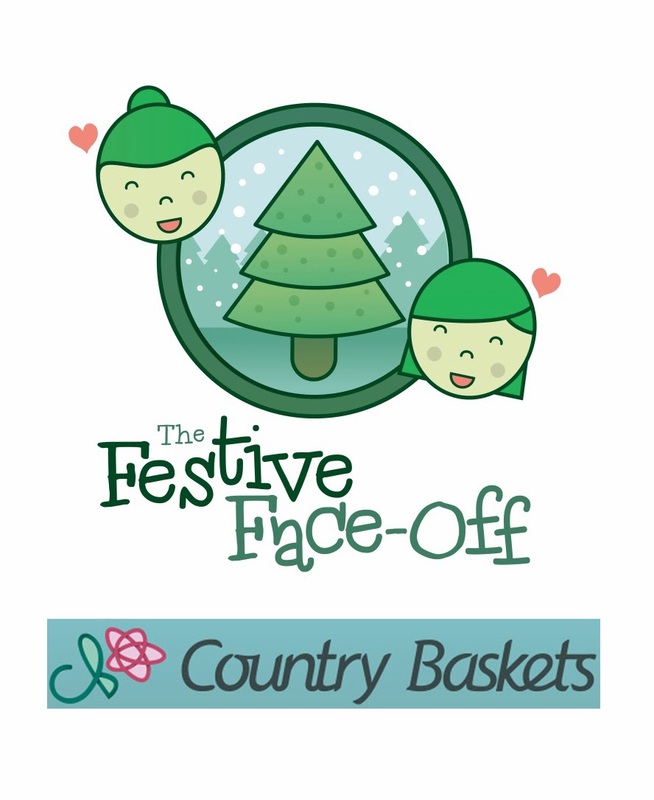 I had a lovely email from Country Baskets asking if I'd like to take part in their Festive Face Off with some other wonderful crafty bloggers. 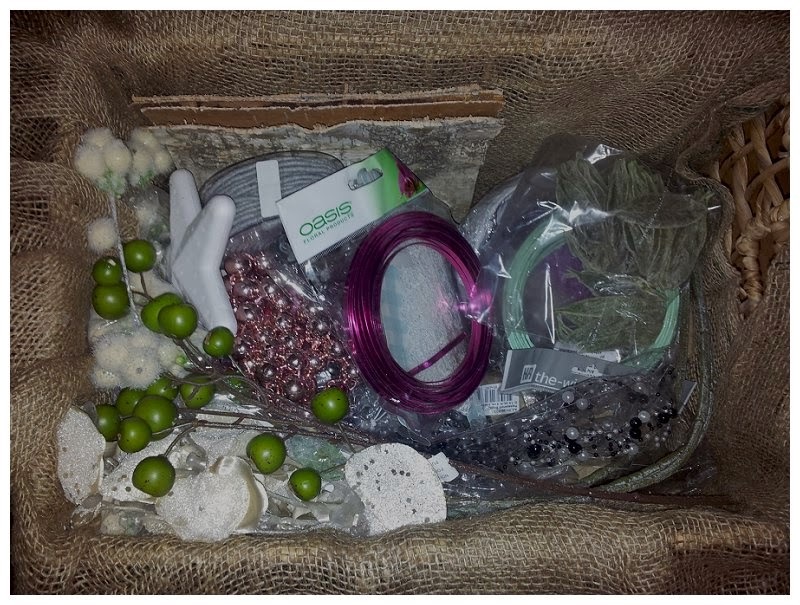 The challenge - to create a Christmas decoration for the home or garden using the contents of a Country Baskets craft hamper (and your own supplies too) to be in with the chance of winning Country Basket vouchers and importantly having all the decorations made given to a charity of your choice, along with a cash donation. 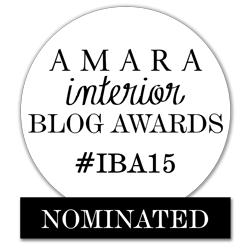 As we support ‘Roundabout’ through my WI, I immediately thought that if I won, they would be my charity of choice! 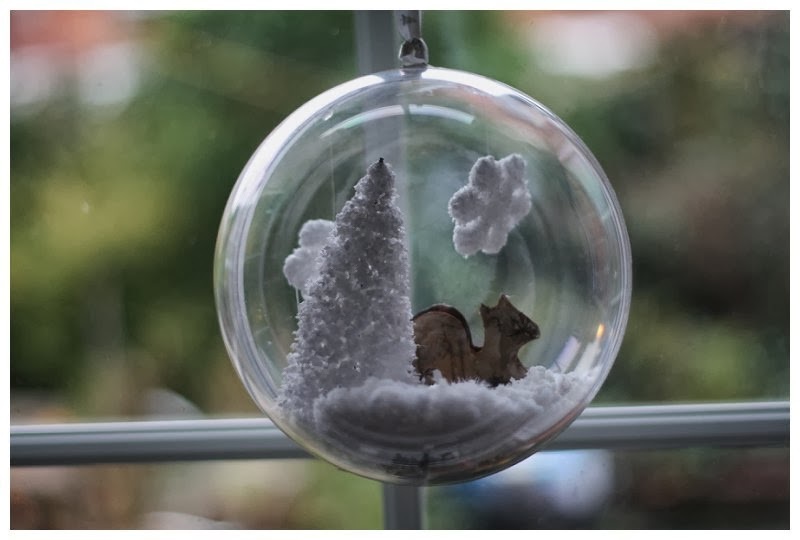 As soon as I opened the hamper and saw the supplies I was drawn to the giant bauble – I’ve long been a fan of the smaller versions of these and my brain started working double time to think what I might be able to make with it. Delving deeper I came across some sheets of wood bark, some beautiful snowflakes and some branches of silvery berries and a few pine cones. 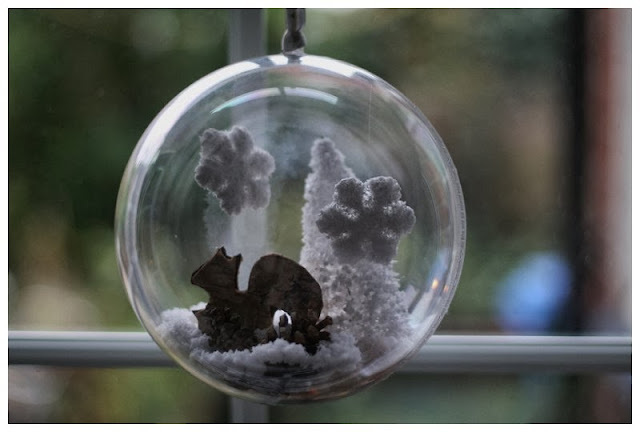 So after some serious thinking I decided to try and create a woodland scene inside the bauble because I hear woodland is all the rage this Christmas. Firstly I took the bark and drew round the shape of a squirrel, twice, on the back of it, (facing in opposite directions so that I could stick the two together and just have the bark on the outside) I glue gunned these together and waited for it to dry. Once it was all dry, I glue gunned my squirrel to one half of my bauble. On the other side of the bauble I stuck a once fibre optic Christmas tree that I had in my midst, as close to the join as I could. 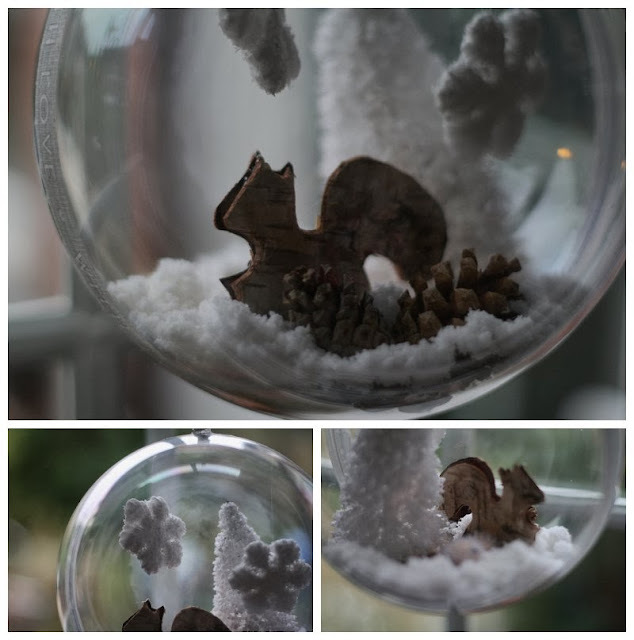 Around the ‘floor’ of the bauble, at the feet of the tree and the squirrel I hot glued some of the silvery berries I had pulled off the branches they came on and some small pine cones, to create a woodland look, and from the ‘sky’ I hung, with fishing wire, some of the pretty snowflakes that were included too. 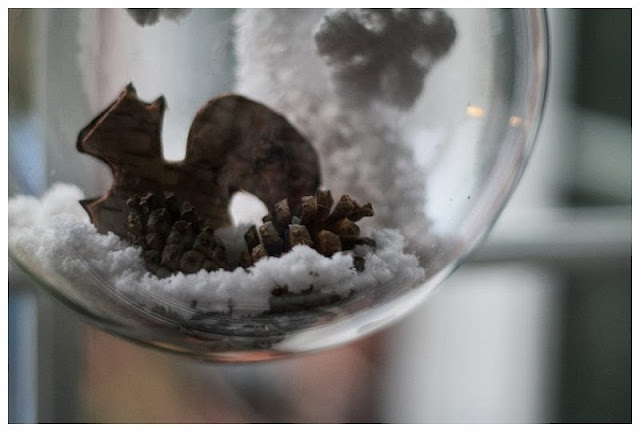 Lastly I threw in a little ‘magic snow’ picked up from the £1 shop for a slightly snow globe approach to it all. There were also some really pretty wood and glitter leaves that I wanted to incorporate too but I ran out of space in the bauble. 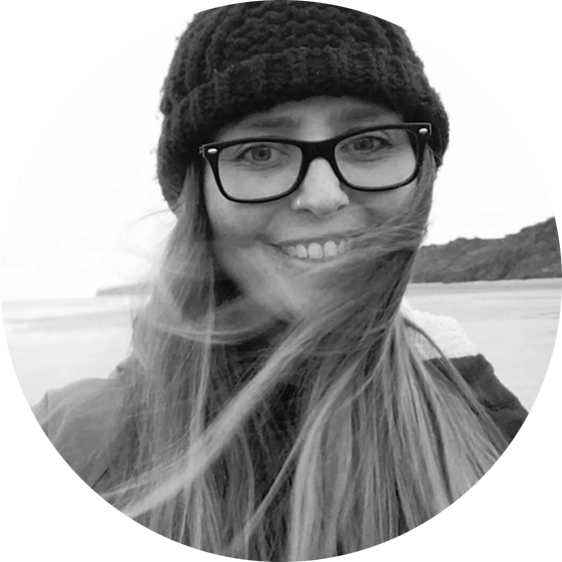 I’d have liked to have found a little plastic deer and maybe a toadstool to add in too but as timing was an issue, I didn’t quite manage that. So, what do you think? Not bad for an evenings work right? 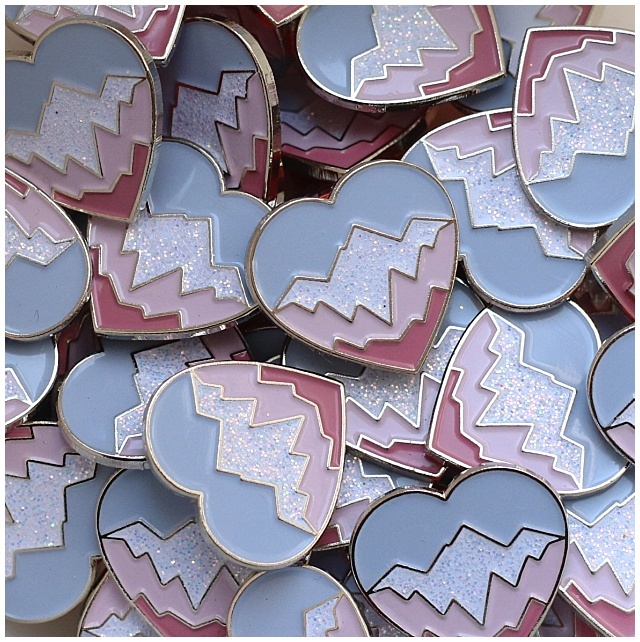 You are going to be in crafting heaven with them when they are older. It'll be amazing. Thank you - I love the wreath you made too. 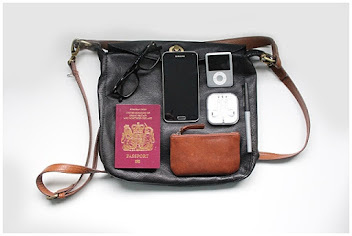 that is brilliant. I love the detail. Oh, thank you. 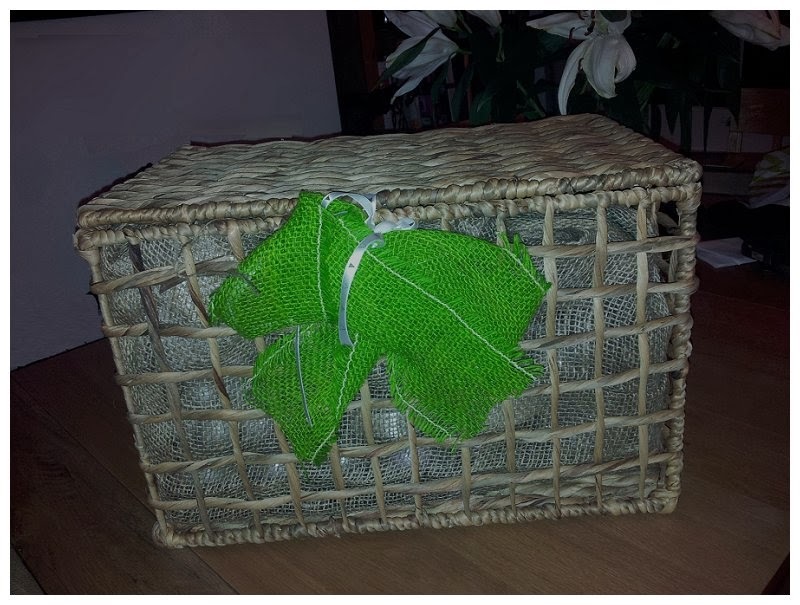 The Country Baskets hamper made it easy to do!